MyMemories Blog: Sunday Designer Challenge.....featuring Design by Marcie & Syrena's Scrap Art! Sunday Designer Challenge.....featuring Design by Marcie & Syrena's Scrap Art! Each Sunday we feature a layout challenge taken on by our Designers! I’m super excited to be today’s Feature. When I first heard about doing this, I was jumping up and down. I was so excited that I was going to be able to share with all of you. I do love to share! When I am making a kit, I always have my children and husband in mind. I enjoying using my own kits and I love that they are so kid friendly yet I can still create something stunning with them. Today I have 2 layouts that I did of my kids catching tadpoles. We have a pond that we were in the process of making. It of course had to rain and fill it in before we had a liner there and some frogs found it. Well then we had tadpoles. Of course the kids loved seeing the eggs, then finding the tadpoles, and then seeing them change to frogs. I loved watching them see what the frogs were up too. This particular day, they and a friend wanted to catch a couple and put them in the deeper end of water since the water was drying up. They were chasing them around and doing a mini rescue! It was so adorable. Now of course I had to scrap all the fun and so I first started by picking the pictures I wanted to scrap with. I wanted one of each the children trying to rescue or hunting for them. I had one photo that had the 3 of them in there since the kids were moving a lot. I wanted my page to reflect the hunting so I put in some paper layering. However I did not want the papers in the middle to be just layered on top so I opted to put in portions of the papers here and there with the right side having 2 papers layer right to the edge of the bottom paper. I then took my elements and “hid” (layered) them around too. I placed my photos around and just moved them to where I liked them best continuing the layering. Now to add my drop shadows to showcase that layering more. I wanted some elements to pop off my page and others to feel more like they were just lying there hiding. When I was doing my leaves, I opted to warp the shadow after I put it on my page. I always have my shadows on a separate layer so I can play with them. I have Photoshop, but you should be able to do this in any program. I created a new layer, then selected the element I wanted to put a shadow on (marching ants), then on the new layer I filled it with a dark brown. I use dark brown over black because I feel it gives more depth and warmth to my pages. Then I selected blur – Gaussian blur and blurred it till it looked good. I think my radius was around a 9 but depending on the item it can be higher. I then got the move tool and once I could see the bounding box on the shadow, I held down the control key and with the mouse moved a corner till it was where it looked good. Then I just dropped the opacity down so it was not so dark. The lighter it is the higher off the page it will look. So now everything is looking great! I added a title to my page and then decided to “frame” the photo with the 3 children in it. But I was not happy with it just being framed so I titled it. It made it a focus point but not overly done. I also had these 3 photos of my daughter trying to get one of the tadpoles. She was sneaking up on it! I opted to put those pictures on a page by themselves. I kept everything very simple, but kept the layering from the other page. The edging looked too plain so I opted to put a frame around the whole thing again mimicking the other page. I also opted to make one photo very large and mask it onto my page. I also dropped the opacity on that so that it would not be distracting to the rest of the page. I made some word art for this page too. I just had to giggle at the tadpole trying to be a frog when it’s my daughter trying to be a grownup and mommy hoping she stays a little girl for a while longer. My masking was very simply too. I copied the photo and hid the original. Then I selected the photo I could still see (marching ants). I reversed my selection so that what I was going to do would happen from the outside in. Then I feathered the edges around 200, reversed my selection again, and controlled J to put it on a new layer. I hid my photo so I could see my masking and it was just perfect and simple! And now I have a beautiful 2 page spread of my kids being kids! You can find Catch of the Day in the MyMemories Design Shop! My scrapbooking represents a lifetime of caring for and being around kids. From being the oldest sibling to being a grandmother. I was a stay at home mom, the one who's house was always full of kids. At church I was the Director of Children's ministries and the children's choir director. When my kids both started school I went back to school and became an elementary school teacher. My students were always asking me to draw something or show them how to draw something, my classrooms were always filled with color and art. Then I became a grandma, it is awesome being a grandma! Later I went away to learn to be an animator, and guess what at school I seemed to collect big kids. Even now we always seem to have those big kids hanging out. So you could say my designs are highly influenced by life with kids. Now on to this layout. I started with the picture of my oldest son and two adorable grandsons taken a few years back. They were at a pumpkin farm in the fall which brings memories of that farm and all the brilliant colors. 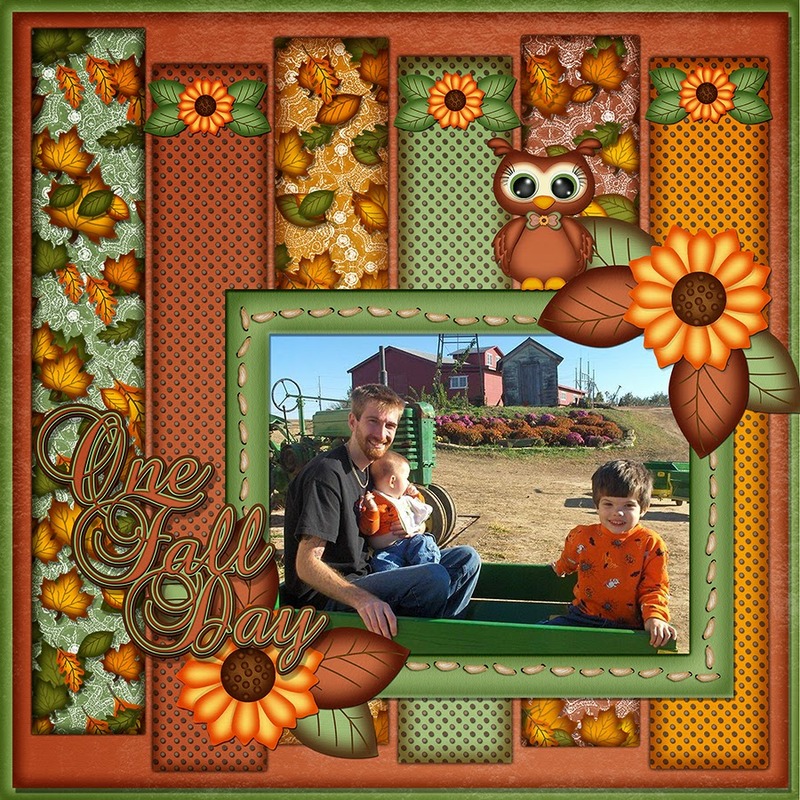 I choose my Digital Kit, "Fabulous Fall Owls" to create the layout. I wanted to use all the wonderful colors in the papers so I made strips for the background, added the photo, frame, and embellishments. The hardest thing for me with this layout was the title. I had it all done then the title did not seem to fit anywhere. I made several versions of the title and finally settled on this one. In the end I love the layout! When I design my kits I usually start with a color palette. Then I use that palette to make papers/backgrounds. As I am making the backgrounds the rest of the kit comes to life, my mind thinks of things like, "oh, a bear in a cute little dress would go with this" or "this will make an awesome little boy kit". Other times I have a theme in mind for the kit, but the first thing I do is define my color palette. 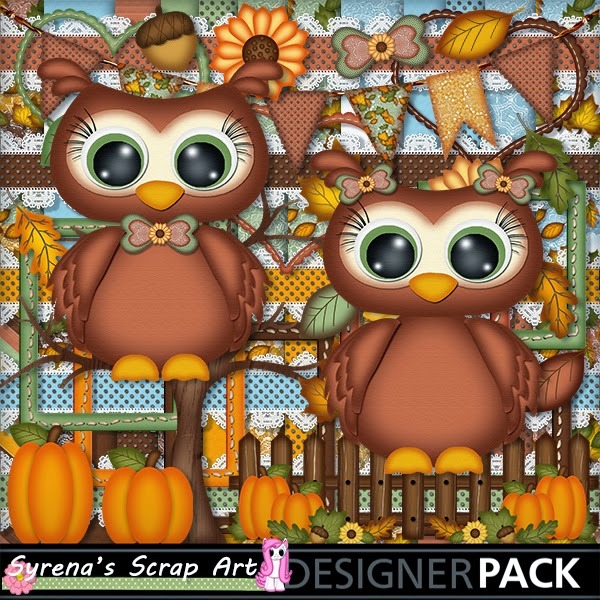 You can find the "Fabulous Fall Owls" kit here. I loved this layout so much I made a quick page of this layout that will be in my store very soon!